The proper installation of new sod to create a stunning lawn is both an art and a science. Our highly trained crews at Tropical Gardens Landscape have perfected the new lawn and sod laying service. Proper preparation of the site prior to installation is the absolute key to having a healthy, long lasting lawn. Assuring that weeds do not return through your new sod by multiple herbicide applications prior to the installation and proper removal of your old turf and leveling are just a few of the key preparation techniques that we adhere to. The sod we use is of the very highest quality available, always cut fresh the morning of delivery. From the time our sod laying team arrives at your property, we work quickly to ensure that the surface is perfectly prepared to receive the new sod. Tropical Gardens has over 20 years of combined turf management experience and is dedicated to the proper preparation and installation of all varieties of turf available to our areas. Our knowledge of each individual variety as well as what preparation and maintenance requirements may be, truly set us apart. Not only can we handle the correct installation of your sod project, we can handle the ongoing maintenance as well. There are three main types of turf varieties available for our area. Of these three, only Zoysia and St. Augustine are viable for residential and commercial applications. An extremely nice choice for the discerning client. This fine bladed turf grows extremely thick to shade out weeds and withstands higher traffic areas much better than any of the St. Augustine varieties. Less pest issues than St. Augustine and some shade tolerance has been found. Water requirements are low, with some drought tolerance. Turf will go dormant if we see colder temperatures, returning as ground temperatures rise. Maintenance requirements are weekly mowing at ¾ – 1” using a reel mower or 2 – 2 1/2 “ using a rotary mower. Monthly preventative pest control and 8-10 fertilization applications annually. Water requirements of 1” of rainfall or irrigation per week. It is recommended that this turf be reel mowed and string trimmers not used. Although there has been obvious success with rotary mowers and string trimmers to trim, these choices in equipment for this variety is not the proper maintenance for this variety. Tropical Gardens has a maintenance team that uses only reel mowers for the Zoysia varieties and the difference is obvious. Ask us and we can show you. High end cultivar that has been designed to bring the best of both Bermuda and Zoysia qualities. Low growing with deep root structure as well as horizontal rhizome growth. Excellent shade tolerance and the best wear tolerance. Slow growing, so any turf damage does take time to regenerate and fill in. Minimal watering requirements compared to St. Augustine. Less known pest issues and normal fertilization requirements for our region. Maintenance requirements are weekly mowing at ¼ – ¾” using a reel mower. Monthly preventative pest control and 8-10 fertilization applications annually. Water requirements of 1” of rainfall or irrigation per week. If your desire is to have the absolute best and do not mind the higher maintenance requirements, then by all means this is the choice for you. One of the shade tolerant varieties of St. Augustine. Has a wider blade with deep emerald green color – Maintenance requirements are weekly mowing at 2 – 2.5” using a rotary mower. Monthly preventative pest control and 8-10 fertilization applications annually. Water requirements of 1-2” of rainfall or irrigation per week. This is another of the shade tolerant varieties that has a dark green, bluish hue – Maintenance requirements are weekly mowing at 4 – 4.5” using a rotary mower. Monthly preventative pest control and 8-10 fertilization applications annually. Water requirements of 1-2” of rainfall or irrigation per week. This is the obvious choice if a full sun variety of St. Augustine is what you are looking for. This being the most popular sod used in Florida for many years, has a deep green hue. Maintenance requirements are weekly mowing at 4 – 5” using a rotary mower. Monthly preventative pest control and 8-10 fertilization applications annually. Water requirements of 1-2” of rainfall or irrigation per week. The most shade tolerant of the St. Augustine varieties, will handle down to only 3 hours of direct sunlight. A lower growing sod variety that can be mowed at a lower height. Maintenance requirements are weekly mowing at 2 – 2.5” using a rotary mower. Monthly preventative pest control and 8-10 fertilization applications annually. Water requirements of 1-2” of rainfall or irrigation per week. A premium variety that has a nice blue-green color. Its fast, lateral growth has shown that Sapphire can recover from damage quickly. Thinner bladed and softer feel makes this an excellent variety for the client wanting the St. Augustine look, yet wants the softer feel of a finer bladed variety. Although it does have some higher wear characteristics, this is not the turf for high traffic areas. Maintenance requirements are weekly mowing at 2 – 2.5” using a rotary mower. Monthly preventative pest control and 8-10 fertilization applications annually. Water requirements of 1-2” of rainfall or irrigation per week. Drought resistant and very few pest issues, this turf variety is the most used for industrial and right of way uses. This is known as a pasture grade grass and we have installed this variety numerous times in residential applications under the right circumstances. If you have a large expanse of dirt that needs turf coverage and do not have irrigation, this may be an alternative for you. Maintenance requirements are weekly mowing during the summer months at 4 – 5″ using a rotary mower. There are no weed control options for this turf and will become overtaken by weeds in a 2 – 3 year period. The higher it is mowed, the longer it will stay a viable turf stand. Seed pods that protrude up to a foot above the blades are often an eyesore to the customer during the growing months. 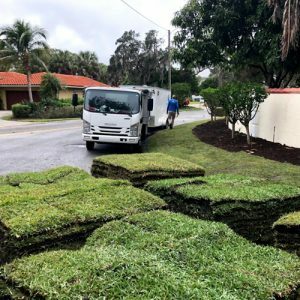 When it comes to Sod Installation, our reputation speaks for itself. We have done many projects in the Sarasota area, from residential to commercial, estate style beachfront homes to small lawn renovations. We include a 90 day warranty on all of our sod projects and every installation comes with a FREE Fertilization, Insecticide and Fungicide Application. Contact us for a free no-obligation quote. We will come measure your property, examine the present turf and discuss the different varieties of sod that may be available to work within your needs.